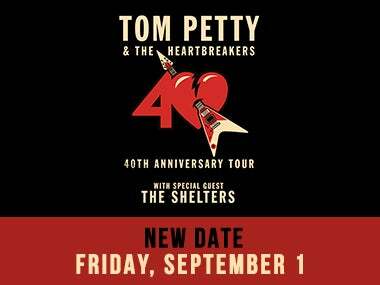 June 5, 2017— Tom Petty and The Heartbreakers, one of the most iconic bands in American music history, have announced additional dates on their 40th Anniversary Tour, which includes at stop at Golden 1 Center in Sacramento on Friday, August 25th. Emerging Los Angeles rock band The Shelters will appear as special guest. Tickets for the show at Golden 1 Center will go on sale to the general public on Friday, June 9th at 10am local time at www.APEConcerts.com and www.Ticketmaster.com. Special pre-sales for Tom Petty and The Heartbreakers Highway Companions Club members will begin Wednesday, June 7th at 10a.m. Pacific time. Further details on Tom Petty and The Heartbreakers’ 40th Anniversary Tour are available at www.tompetty.com.